It’s no secret I am an ardent Perricone fan. My core skincare regime is all Perricone, with a few other brands popped in for good measure. Before I started writing this blog the kind peeps at Perricone sent me this product for customer review as they knew of my love for the Advanced Face Firming Activator from my many interactions on their facebook page. Formula 15 marks 15 yrs of anti- aging research for Dr Perricone. This is his super- charged ADVANCED Advanced Face firming Activator. The already patented science of DMAE and Alpha Lipoic Acid have been increased in this formula for a power punch of these proven ingredients. I just know that my skin, which is not as young as I’d like to admit, is looking tightened, my pores refined and my texture soft and fine. The ALA acts as a strong anti-oxidant to fight free radical damage and helps improves nasty discolouration. DMAE boost the elasticity of my skin for a more youthful appearance. All this goodness is sent straight to the correct layers of the skin with their new NTP complex, a super smart delivery system. The texture of the cream is somewhere between a serum and a lightweight lotion. It is fine for my oily skin and since it is used under a moisturizer it would be perfect for dry skins. I am using this instead of my AFFActivator in the morning. I make sure I take it up towards my hairline, crows feet area and neck to get full benefits of the contouring ingredients. The Perricone MD website states it helps “tackle the length, width and depth of a wrinkle”- this is of course over time, so don’t expect a wrinkle free face by the end of the day. What I can say is that my mini- wrinkles in the making are looking softer and my face fresher. 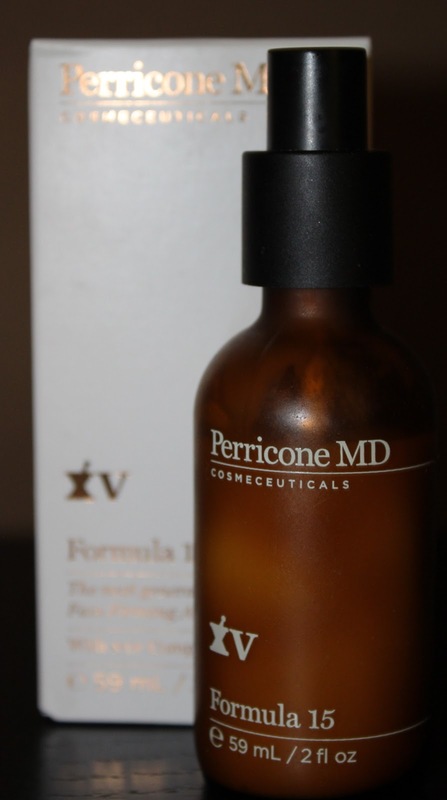 I will definitely continue to use Formula 15 as with Perricone MD products, the science just make sense to me and I feel my skin is getting ingredients with loads of research behind them. This little nugget is also paraben free. So if you need a little nudge into Perricone territory, this would be my first choice as a start. A good friend of mine now has little parcels whizzing across the Atalantic(Pacific?) after I introduced her to Perricone MD (S you know who you are!) I am guilty as charged, a full on Perriconista. But, I do promise to do some reviews of my other favourite skincare brands soon. Next Next post: Addiction by Ayako Cheek Stick in Amazing – the name says it all…..